Weider Pro 225 L Weight Bench Review - With Video! 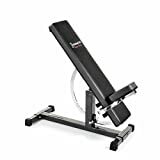 If you are having trouble looking for an affordable weight bench to suit your needs the Weider Pro 225 L weight bench is a very versatile bench for the price bracket, most benches in this price bracket, do not have incline options. Many benches at this price have a wobble. Seat wobbles are commonplace with budget benches, you will also find that many cheaply made frames are unstable, the last thing you need when you are benching some heavy dumbells is a wobble, it could cause you a nasty injury, some benches have been known to topple over. Thankfully Weider’s weight bench sits quite low, this combined with the wide stabilizer bars and rubber capped feet will do a great job of giving you the much-needed stability. On to the foam rollers, the purpose of the foam rollers is to keep you stable throughout your exercise. Sometimes when you are lifting heavy dumbbells it’s difficult to keep yourself from sliding down, this feature may come in handy for keeping a stricter form. The foam rollers are a little narrow for my liking and could be uncomfortable for taller users. I think some may have to put their feet in front of the rollers for a more comfortable position when using the decline option. Joe Weider remains one of the most well-known names in the fitness industry. Weider fitness has been able to retain a strong presence in today’s bustling fitness marketplace. They provide well made lower priced training products. It’s important to note their products are not aimed at serious weightlifters. Weider’s fitness equipment, is, in general, designed for light use and is not designed to last over the long run. In addition, Weider training equipment is not designed for heavier weight workouts. 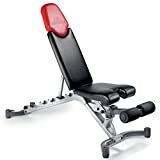 Weider’s bench is designed well for incline dumbbell workouts like the incline press and incline bicep curl, the angles of the seat will aid stability with incline workouts, but not being able to adjust the seat for flat workouts is a downer for me. 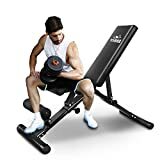 The design of the bench seems to be quite solid, most people using the Weider Pro 225L bench have reported the bench to be very stable even for bigger guys, up to 6’2 weighing 250lbs, who gave a good review of stability and user-ability with the bench. Personally, I think people over 6 foot may struggle with the bench due to the height of the backrest and how close together those front rollers are. But for average guys and girls, this bench will work well as a beginner bench. There is no attachment for leg workouts, and no option for adding one, you would not expect this option for a bench in this price range. Looks like you have to put this one together yourself, but not to worry, should take no longer than 30 mins, it’s fairly easy and all you need is a few simple tools. Allen Keys, sockets and a wrench. For under $50 build quality isn’t bad at all. As mentioned earlier, Weider’s benches are not known as a high-quality item, the beaches are made for beginner weight lifters or as an addition for an overall fitness routine. 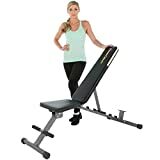 Do not expect the build quality of a Bowflex bench for 41 bucks, like I say for the money it’s priced at today, this is a well made stable bench. It’s a nice looking bench, the upholstery is easy to clean, the cushioning isn’t too cushy and not off-putting. Great for light use 3-4 times a week. Weider’s fitness bench comes with the incline, flat and decline options, to have all of these variants in the same price bracket you would normally pay for a flat bench, is fantastic value for any starter bench. It’s a shame the seat isn’t adjustable. Like all benches bought separately I do not recommend barbell bench pressing unless you have a rack, and even if you do have a rack and bought this bench, I wouldn’t recommend benching anything over 100kg on it. I know it has a max user and weight load of 410lbs but I don’t know if it strong enough, there have been a few reports of the welds snapping under heavy weight. This shouldn’t put you off this bench as it is designed for light use and beginners and if you want to take it up to its max weight and it breaks you are well in your rights to get a refund and exchange the bench. If they say it will take 410 max weight and body load then it should, and more really, but I wouldn’t trust it that heavy. Summary You will get some valuable dumbbell work from this bench, more serious bodybuilders will have to splash some extra $'s and choose a bench more suited to their needs, but if you want to spend under the $50 mark, then I doubt you will find a more versatile, stable bench than Weider's 225L weight bench.